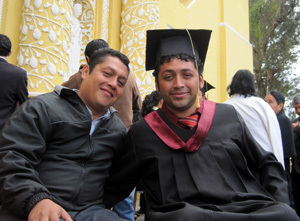 Transitions’ Special Education Program was initiated in 2000 in the indigenous community of San Antonio Aguas Calientes, Sacatepéquez, located six kilometers from the city of Antigua, Guatemala. The majority of San Antonio’s residents live in poverty and the gaps in services for children with special needs are severe. Thus, the program started as a response to the local community’s need to educate its children with special needs. The special education classroom now serves over a dozen students each year, providing specialized, one-on-one instruction necessary for independent living. In 2011, this program aims to grow and enhance the scope of services offered, including re-evaluating curriculum, incorporating additional learning aids, providing access to speech and physical therapy, and building a vocational training component into the program. This program sets a high priority on building awareness regarding disability and educating the community to this end. A major goal is to rehabilitate and educate students to the extent that they can enter traditional schooling, supporting Transitions’ belief in inclusive education. Transitions is continually looking for individual sponsorships for our students in San Antonio. Should you be interested in sponsoring a child’s education, please contact [email protected]transitionsfoundation.org.